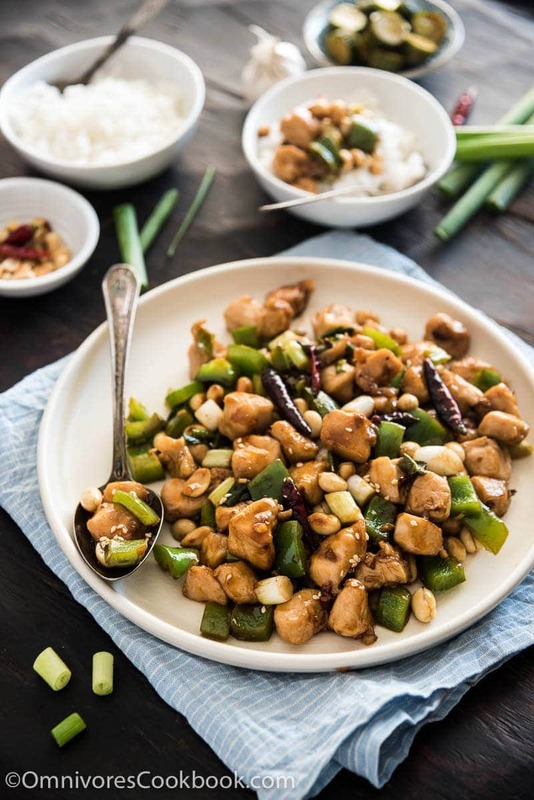 Balanced sweet, sour, numbing, spicy, and savory flavors make for the perfect kung pao chicken. Learn the technique to recreate the authentic flavor in your own kitchen. 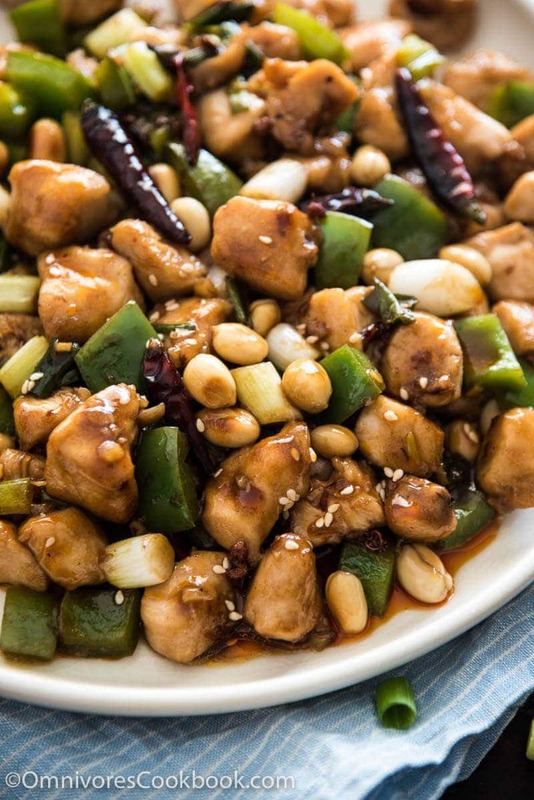 You will find Kung Pao chicken on the menus of many restaurants in China. Yet each restaurant has a different version, sometimes with entirely different flavor profiles. It is difficult to say which version is the best. At the end of the day, it really depends on your own palate. 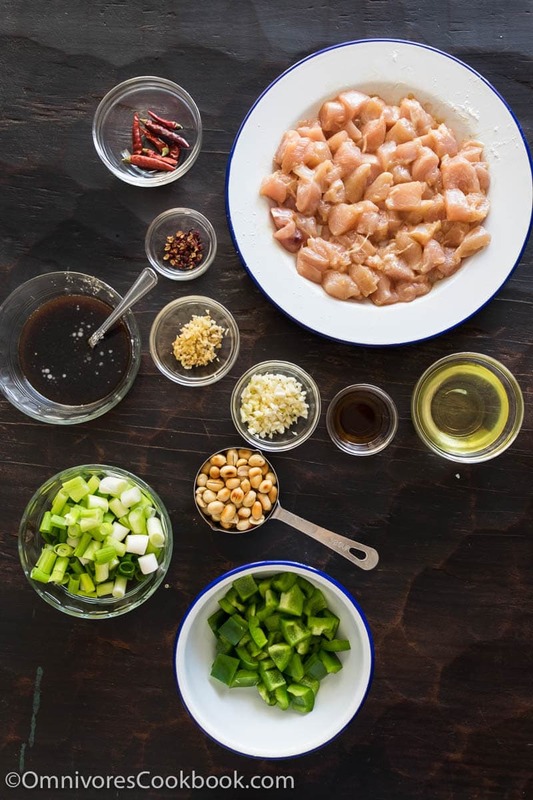 The quest for the best Kung Pao chicken recipe was not easy. I tried recipes from cookbooks by Fuchsia Dunlop and Kian Lam Kho, and learned from many recipes online. Now I’m sharing my favorite version with you. The real-deal Szechuan version uses exclusively skinless breast, but you can use thighs, as well. During my experiment, I found chicken tenderloin to be a great option. Because it is very easy to cut into even squares that are the perfect size for stir-fry, and it yields an even tenderer result. 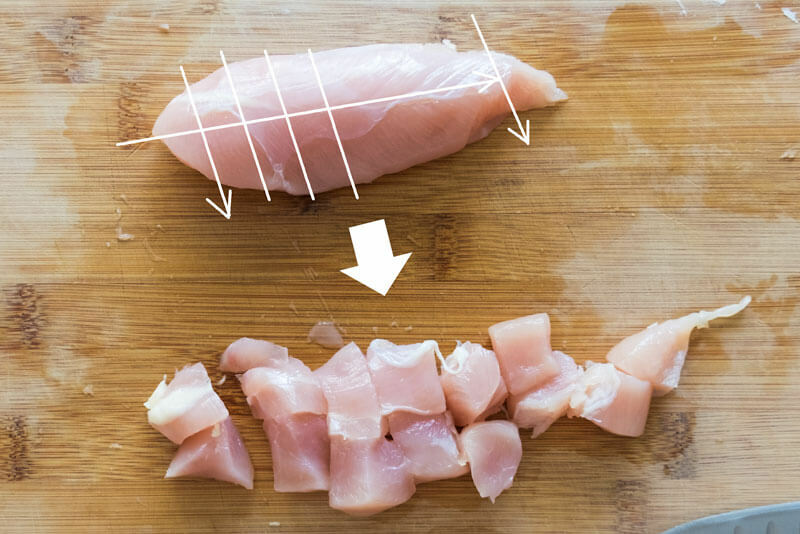 To cut tenderloins, remove the tips, divide the tenderloin lengthwise evenly, and then slice crosswise into 1.5-cm (3/4-inch) cubes (see the picture below). The salt in the light soy sauce tenderizes the chicken. The cornstarch forms a protective layer so the chicken won’t be in direct contact with the heat and will remain juicy after cooking. The oil prevents the chicken from sticking to the wok during cooking. The marinade should be just enough to coat the chicken without forming a pool of liquid in the bowl. Note, if you use a different starch, such as potato starch, you will need to use a bit more (about 3 teaspoons) to get the proper texture. Use a moderate amount of sauce, just enough to coat the chicken. Be generous with aromatics, especially green onion and garlic. Cooked green onion is tender and sweet. It adds nice texture and flavor to the chicken. Green onion is a prominent ingredient and every single bite should contain some of it. If you fry the peanuts with a small amount of oil and let them cool completely, they will become extra crispy. I did not include this step in the recipe, but Chinese restaurants usually do this prior to the stir-fry to maximize the crispiness of the peanuts. If you’re cooking a dish to entertain guests, do this for best results. For everyday cooking, skip it, because it is quite time-consuming. To create the best texture and impart a smokiness to the dish, you need to use a wok and cook with high heat. The best setup is a gas stove and a cast iron (or carbon steel) wok. If you have an electric stove, use a large skillet with a large contact surface with your stove. 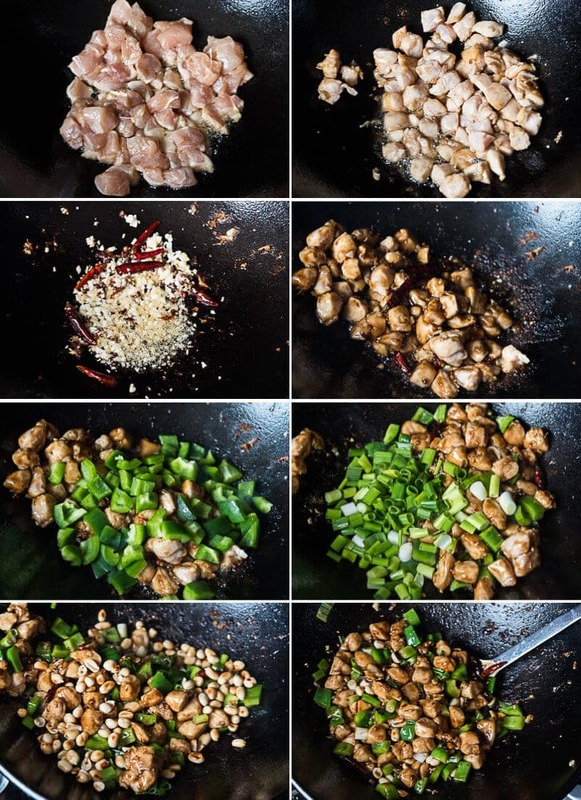 In this case you will pan-fry the chicken instead of stir-fry. The taste of the dish will change but remain delicious. Using a wok on an electric stove won’t generate enough heat. The chicken will be cooked in a lukewarm pan and the dish could easily turn out mushy. Also, remember not to crowd the wok. I use a 14-inch cast iron wok and a pound of chicken is the most it can handle. This is the most important step when it comes to stir-frying. Because you will work with the highest heat, the cooking will be finished in mere minutes. I timed my cooking and it was less than 5 minutes in total. This means you won’t have time to hesitate and fetching ingredients from the cabinet. All the ingredients should be ready and laid out near the wok. The Kung Pao chicken you see in China has a beautiful red color. This color comes from slowly cooked dried red chili peppers, and this result can be difficult to achieve at home. You will see many recipes that require a handful of seeded chili peppers. The problem is that your dish will end up very spicy if you choose the wrong type of chili pepper, even if you remove the seeds. A good Kung Pao chicken is not overwhelmingly spicy. Second, you still won’t be able to get the perfect red color because you’re cooking with high heat and the chili pepper will easily burn instead of roasting, which it needs to do in order to release the red pigment. That’s why Andrew Zimmern uses annatto seeds (a source of natural red food coloring) to create a red oil that is not spicy, to add into the dish. My favorite way is to add less dried chili pepper at the beginning of cooking, and use a small amount of homemade chili oil at the end. This way you can control the spiciness and add an extra layer of flavor to the dish. Are you ready to cook? Let’s start! Want more delicious stir fries? Check out sweet and sour chicken, black pepper steak, eggplant in garlic sauce, and scallion beef stir fry. Dice chicken into 1.5-cm (3/4-inch) chunks. Combine chicken, soy sauce, cornstarch, and oil in a small bowl. Mix well by hand and let marinate for at least 10 minutes, up to 30 minutes. Heat a wok over medium high heat until hot. Add 2 tablespoons of oil. Swirl the wok and let oil coat the bottom of the wok. When the oil just starts to smoke, spread chicken in a layer and cook for 20 to 30 seconds without moving it. Swirl in Shaoxing wine. Cook and stir until the chicken turns just white on the surface and the inside is still slightly raw. Turn to medium low heat and immediately transfer chicken to a plate. There should be still about 1 tablespoon of hot oil left in the pan. If not, add more oil. Add Sichuan peppercorns into the wok. Cook until the color turns dark brown, but not burnt. Remove the peppercorns with a spatula and save for later use. To serve the dish Chinese style, leave Sichuan peppercorn in. Add chili peppers, white parts of the green onions, garlic, and ginger. Stir a few times until fragrant. Mix the sauce again so that cornstarch dissolves completely. Swirl in sauce. Add chicken back into the wok and turn to medium heat. Quickly stir and toss a few times. The sauce should thicken immediately. Add bell pepper and roasted peanuts. Stir again to mix well. Immediately transfer to a plate. Garnish with the green part of the green onion. Serve warm with steamed white rice. 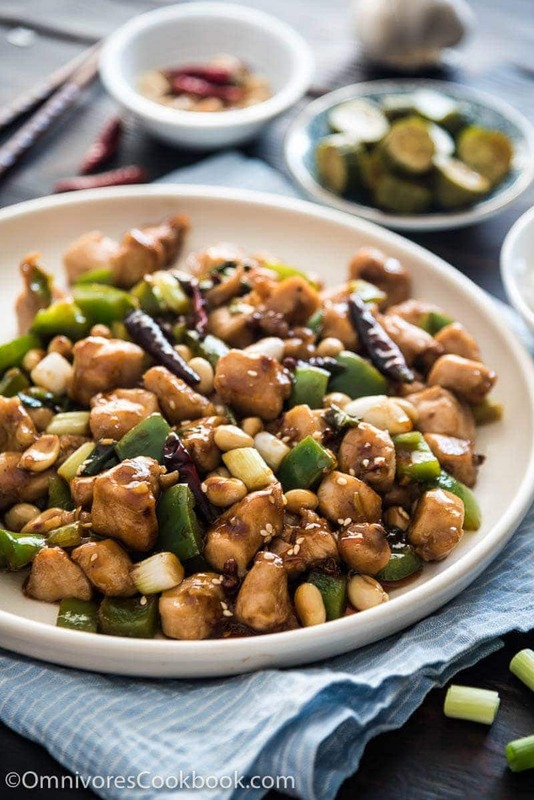 The Szechuan style Kung Pao chicken always uses chicken breast. You can use skinless, boneless thigh as well. The dish will end up with a slightly different texture. Adding wine during the stir-fry instead of blending it into the sauce adds a dimension of flavor. This step is very similar to adding alcohol to deglaze a pan after pan frying. If you do not want alcohol in your dish, you can skip this step. Some Chinese restaurants do not add other vegetables into this dish. Some restaurants use cucumber. You can choose to add a bell pepper just to make the meal more balanced. Bigger chicken/all meat picese are the BEST! this looks delicious!! one of my favourite dishes I ate all the time when I lived in Beijing! looks like you’ve gone easy on the chillies with a red pepper replacement 🙂 stunning photos, bon appetit! Hey, thank you so much for the comment! I just found I made a big mistake about the pepper:S I supposed to mean chili peppe originally… I already corrected the post. Looks so yummy and definitely a healthier version from what we get in restaurants. YUMM. More healthy recipes will keep coming! I absolutely love kung pao chicken but haven’t mastered it yet, thanks for sharing the recipe and so many tips! Your tips are so helpful. I never knew that about how Kung Pao gets its redness, nor did I know that I should have been using chicken breast! I’ll have to give this a try soon! 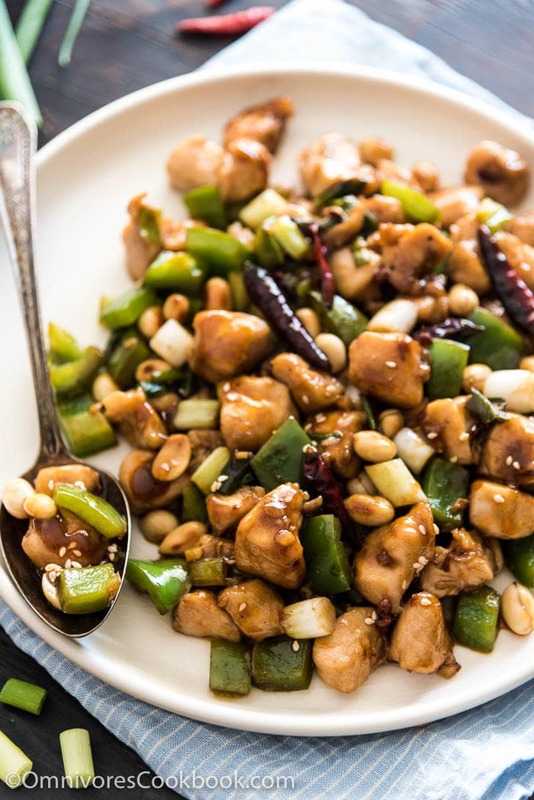 You are my go to source for authentic Chinese recipes Maggie, and Kung Pao chicken is a huge family favorite around here, thanks! I agree with Sue – you make the best authentic Chinese recipes – and I can’t wait to try them all. This looks fantastic. Sharing and pining! I’m so happy to learn from an expert authentic Kung Pao chicken. It looks wonderful and I can almost smell the delicious aroma with all those great ingredients! I love it when I have the time to sit back and truly savour your recipes, Maggie. Reading your explanations and lessons in cooking is truly enjoyable and a real eye opener. You make Chinese food very exciting. talented friend! You’ve inspired me to cook Chinese food at home. Thank you! I love King Pao chicken, but haven’t made it in years. I do like to add bell peppers to the dish. And the anato seeds are a great idea. I can’t tell you how many times I’ve burned the dried chilis! I am a Malaysian and currently living in Beijing. Just came across your blog yesterday and I am already convinced with your cooking! Love how the way you explain each ingredient works. Everything make sense! Will be trying this recipe this weekend. Hi Maggie — I recently discovered your wonderful website, and I used your Di San Xian recipe last weekend, and it was a huge hit! 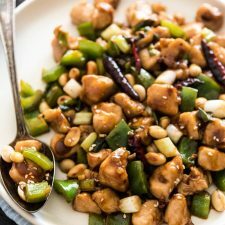 I LOVE Kung Pao chicken, and I really want to make it this weekend, but Chinkiang vinegar isn’t available in Bombay, so I was wondering if there is anything else I could use in its place? You made it very clear that it’s quite differently from the pale Japanese rice vinegar (which is the only thing East Asian cuisine vinegar that’s available in Bombay). Would Balsamic vinegar, or a combination of other ingredients do? Hi, Maggie. I recently found your cooking website and I really enjoy Chinese dishes now. I tried this recipe but it is too sour to me. I think chinking vinegar is the reason of the sour taste. However when I put the leftover this kungpao chicken in the refrigerator and ate the next day, the sour taste was gone and it was so good. So can I remove or reduce the sour taste of chinkiang vinegar from the start? Is it just reduce the amount of vinegar or is there any other method?